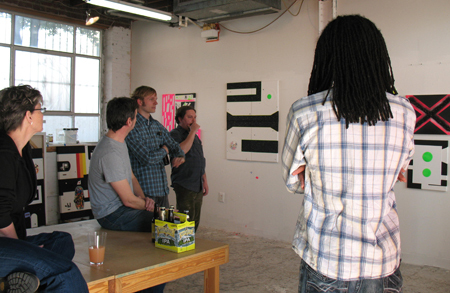 Like myself, Shara Hughes and Ben Steele are artists who have relocated to or moved back to Atlanta. 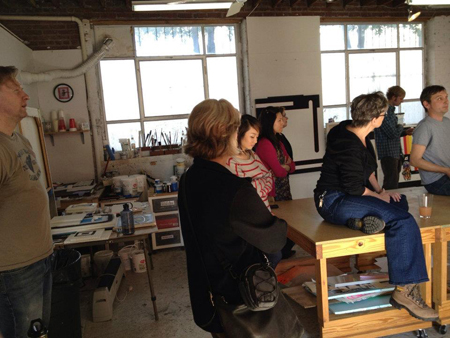 In an effort to engage with more kindred spirits in the area, they recently set up a monthly salon for artists – painters, arts writers and curators are invited to visit a different artist’s studio on a Sunday afternoon. 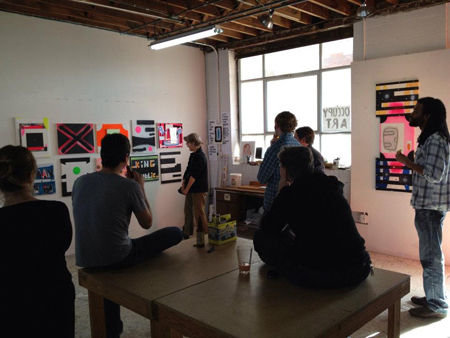 The audience last weekend at Marc Brotherton’s ACAC studio consisted solely of artists and lent itself to a discussion focused on formalized theory and process. There have been casual arts gatherings before in Atlanta, but having this type of structure is a welcome addition. 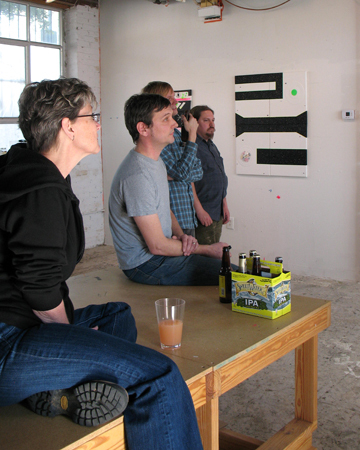 Involved in ACAC’s studio artist program for the last three years, Brotherton is nearing the end of his stay and will probably be moving his studio into his Decatur home later in the spring. We chatted about the advantage of working from home, rather than having to commute. Because he has a young child, he may be building his studio ‘garage’ within shouting distance from the house. A couple of other artists from the program, Dayna Thacker and Nancy VanDevender, strolled over from their studios, giving the gathering a more community feel. Painters are not known for their ability to verbalize their work, but some of the burden of understanding modern art must be shifted to the viewer. What needs to go is the expectation of a narrative to suss out the nuances of anything more abstract than an obvious landscape or figure. It’s tough to talk about art or technique or intent when the whole shebang has to be condensed or deconstructed for the sake of clarity and brevity. Artists speak the same language. But still, trying to discuss art with any non-artist is usually an exercise in frustration. As the folks at this gathering agreed, most people want to know what we do, or how we make a living, or whether we’re actually selling our work. That we’re engaged in a creative act that is of the culture and can change it, seems to forever be beside the point. Another common notion is that an artwork is “profound” by virtue of the story it has to tell and, if the work is nonrepresentational, by the “meaning” it conveys. We are willing to be moved by music despite its lack of reference to nature because we are used to it; we don’t ask it to be full of birds chirping and auto horns. Visual art, on the other hand, was made to be referential and did not move away from depicting the real world until recently – during the last hundred years or so. So instead of yielding to the sensuous characteristics of a work, to its beauty, if you will, people tend to look first, for what it says. That is what motivated the academic artists of the nineteenth century, and it is what motivates Postmodernists today. Yet despite this almost universal initial misconception, basic visual strength has, in the long run, always won out over explicit meaning. In the final analysis, content is unimportant as art. What counts is how the art was made and what the artist has put into to it beyond content; those visual characteristics are the basis of its quality. For example, every image of the Crucifixion is loaded with clear-cut, specific, understandable content and meaning, but very few such images manage to last as great art. Brotherton revealed a few influences (Stella, Albers), described his background and did a great job of talking about his process. While artists are deeply familiar with technique and their materials, they rarely know where they’re going. That’s the beautiful mystery and alchemy of painting. Brotherton is admittedly, no exception. 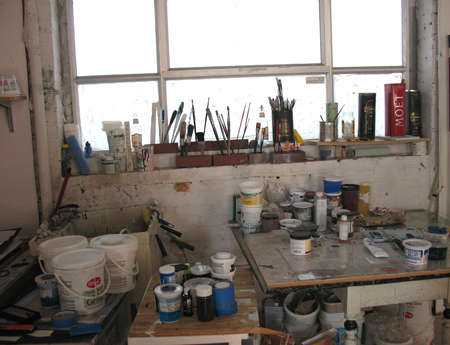 He noted that the artist Thomas Nozkowski has maintained that ‘oil painting loves to be changed’, and it’s true that we painters all love to manipulate our materials. Where do we get our inspiration? Usually from anywhere and everywhere, the flotsam of life. In this interview Nozkowski describes a moment’s decision to depict evocative feelings – which may or may not infiltrate a painting. Some of Brotherton’s work has to do with genetic disorders in his own family. Or it may reflect current political movements, like Occupy Atlanta. There was speculation about ‘revolt’ mirrored in much of his text driven pieces. One work in particular suggests a particular action that Brotherton offers for one political party, but the type is so tiny that most viewers will miss it from afar. I’m not telling, you’ll have to wait for him to show here in Atlanta. 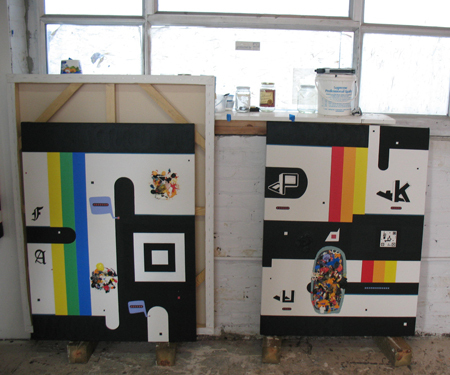 These pieces are going off to Brooklyn for a spring exhibit. Marc noted that while artists are expected to develop a consistent body of work, he wasn’t interested in remaining static. 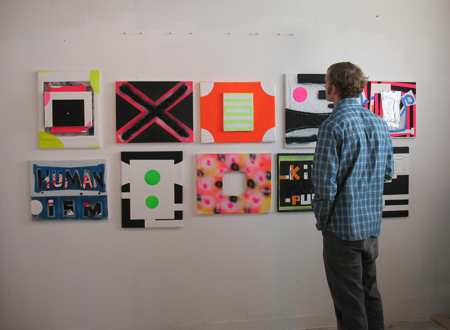 His explorations with black glitter on canvas echo tarmac or a long stretch of highway at night, and his flourescent ‘spots’ of plasticky, peeled off paint from a palette that are glued onto the canvas, along with upcycled styrofoam pieces confirm a wide array of experimentation. Offering the example of musicians, whose work can change dramatically throughout their careers, he countered the idea of a singular path for the painter. I asked about Josef Albers because many of Marc’s paintings consist of colored rectangles, the color dynamics as predominant as the form or structure of his assemblaged or overlaid works. Joannes Itten was Albers‘ teacher at the Bauhaus, and Itten’s classic book, The Elements of Color, was my first in depth commitment to learning color theory. Itten posits fascinating cultural tidbits about color, and he saw relationships between color and music. Symbolism and schematics are used as communicative elements in the work, and Brotherton says he’s interested in information and how the currents of digital bits infiltrate our lives. 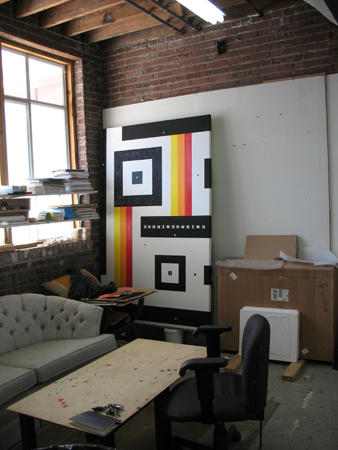 Brotherton will be showing most of these works at his upcoming show at Causey Contemporary in Brooklyn from April 20 – May 27. Thanks Shara and Ben – looking forward to the next Seek ATL salon. Check out Seek ATL on Facebook. This entry was posted in Art reviews, criticism and blogs, Daily meanderings and tagged ACAC, art, art salon, Ben Steele, dayna thacker, frank stella, johannes itten, josef albers, Marc Brotherton, nancy vandevender, occupy atlanta, painting, Shara Hughes, studio tour, thomas nozkowski, walter darby bannard. Bookmark the permalink. Thanks for the tour and the introductions.